Secluded luxury 1 bedroom honeymoon villa located in the village of Islamlar. A blend of traditional and modern styles, with distant sea views and panoramic valley views, plus an extra large jacuzzi. 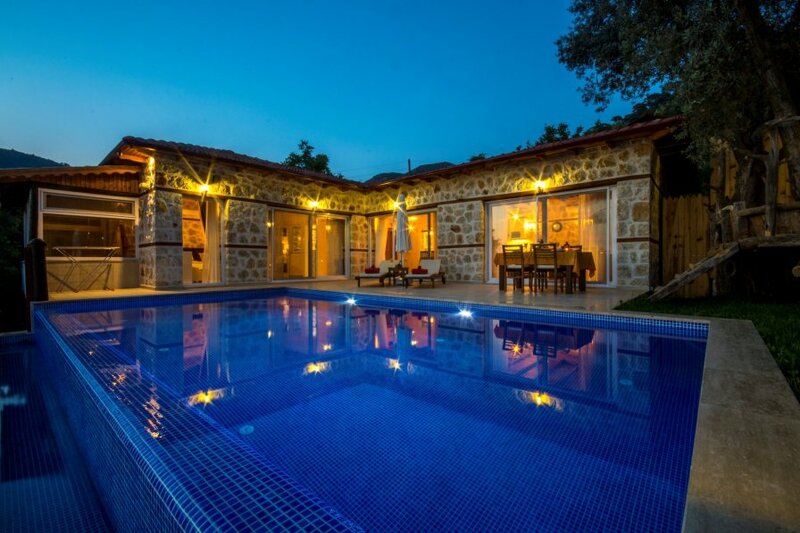 Located in Islamlar village, this honeymoon concept villa has been constructed in local materials to achieve a luxurious country style. It has one very large bedroom, with en-suite bathroom, plus a extra large jacuzzi from where views acroos the valley can be enjoyed in total privacy. The villa's capacity can be raised to four by the use of the sofabeds in the spacious lounge area. There is an additional w.c.and laundry room adjacent to the lounge. Situated in a quiet location, that has views out across Islamlar valley towards Patara Beach, the spacious pool terrace is completely secluded from outside, making it an ideal choice for those guests wishing a high degree of privacy. Great attention to detail has been given to ensure guests maximum enjoyment, including features such as a raised timber platform where guests can relax in the shade of an olive tree whilst soaking in the panorama. The kitchen is fully-equipped and there is an adjacent indoor dining area. Outdoors there is a is a dining table with seating for four, or if guests prefer they can dine on the raised platform area using a traditional style low table. The pool is 8 x 4 metres and 1.5 metres in depth. There are steps into the pool for easy access. Due to the villa's remoteness from local facilities, (nearest shop or market 2.5km away), it is recommended that guests have the use of a vehicle. The pool is completely secluded from outside the villa.